The following are the memebers working in the curia. Fr.Pothireddy Anthony is the provincial, Fr.wilson clement Mariadoss is socius & Admoniotor to the provincial since june 2012. He is also a editor of VANI. Fr.Antonysamy Visuvasam, is the Province Treasurer since june 2010 and he is also province cordinator for finance. Fr.Ch.Vanachinnappa is secretary to the provincial. The Spiritual Exercises has been the foundation and source of Jesuit apostolates. 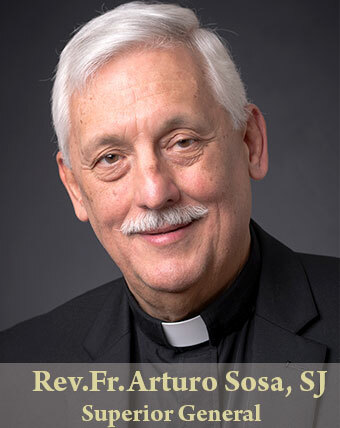 The making of the Spiritual Exercises and giving Spiritual Exercises has been a distinguish ministry of the Society of Jesus all over the world. True to the spirit of the Society as early as 1978, a separate property was brought in the capital of A.P. It was christened “Satyodayam” which means, “dawn of truth”. 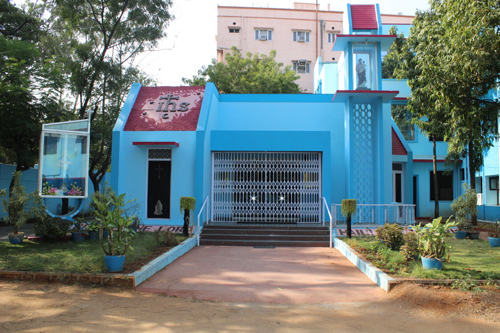 A building consisting of 30 rooms and a chapel was built in 1980 and blessed and opened by very Rev. Fr. Pedro Arrupe, the then Superior General of the Society. 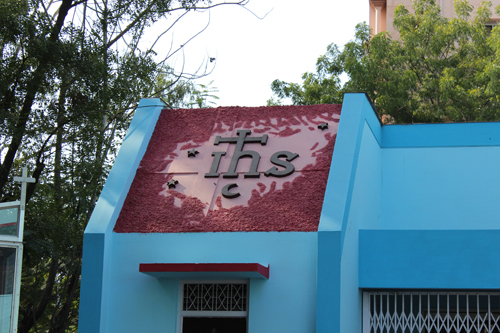 As it is located in the city, it is used as an urban Apostolate centre catering to various spiritual needs of the twin cities of Secunderabad and Hyderabad, Retreats, recollections, seminars and other prayers are conducted for various groups of families and youth. Fathers from this house have been looking after the spiritual needs of so many religious communities and formation houses of religious and diocesan seminary. At a later stage an additional block, named after Fr. M Balaguer, was built containing 9 double bed self-contained rooms, kitchen, conference hail and a dining hall with good facilities. At present Fr. George Stephen is the director of this retreat house. He himself is a well-known retreat preacher both for priests and religious all over India. 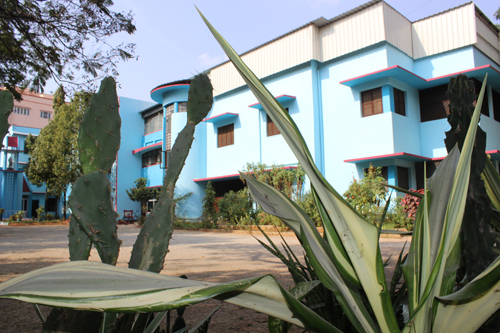 Satyodayam Retreat house is in the heart of the City, some 3 K.M from Secunderabad Railway Station. (Soon we are going to have Metro Station called Tarnaka) Originally it was known as Urban Apostolate centre .In the same house we have the Jesuit Provincialate. Right now there are 4 Jesuits in the Provincialate and four Jesuits in the retreat house including a Jesuit priest student. Since most of the Religious Congregations have their own retreat houses not many come here for regular retreats. Still some choose to come here depending upon the availability of the preachers here. Due to non availability of trained Jesuit staff we do not conduct regular courses. Still we are trying to conduct at least a few courses. 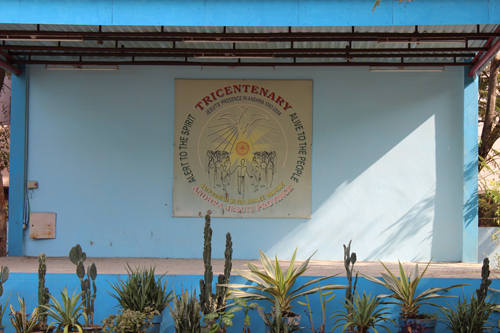 Many NGO’s and other protestant groups come here for regular programmes. Among the Catholics Jesus Youth, Youth United for Christ and Marriage Encounter groups come often and they really edify some of the Fathers staying here. Inner Healing sessions by Fr Vijay of this Archdiocese is conducted once in 3 months. Many prefer to come here as it is easy to come from Secunderabad station and since it is a bit inside from the main road less pollution and very calm. A small chapel inside the retreat house attracts around 30,mostly Anglo Indians for every day Mass and around 45 on Sundays. We call this group as Satyodayam family as most of them get really involved with the church activities. 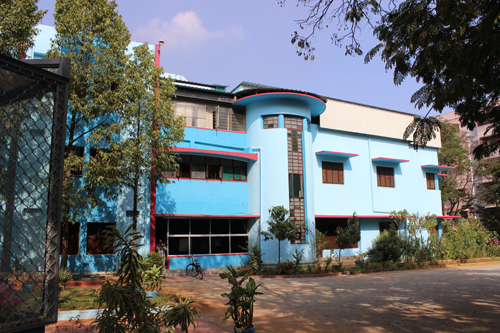 The capacity of the Retreat house is around 75,13 single rooms,25 double occupancy and 5 triple occupancy. 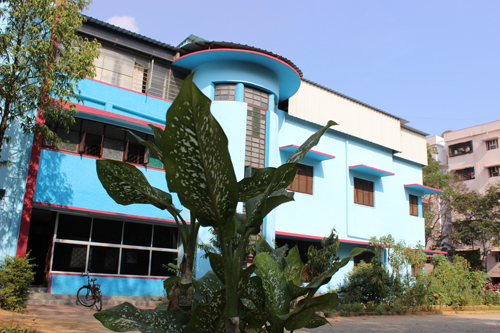 We have a very good hall on the ground Floor with capacity of 70 people and another hall with a capacity of 100 people on the 1st Floor. The side door of the chapel is kept open 24×7.We also have a small dining hall for 50 people and a big dining hall for 80 people. COME AND EXPERIENCE for yourself so that you may be energized for your ministry. From Secunderabad Railway Station take an auto rickshaw and reach ‘Tarnaka’ [ 4-5 Kms] on Uppal Road. On the Junction, with BP ‘University Petrol Filling Station’ at left, freely take left turn from Uppal Road. Thereafter, drive for few seconds to reach the first road entering at the left. On this road go straight until you reach “SATYODAYAM” on the right. 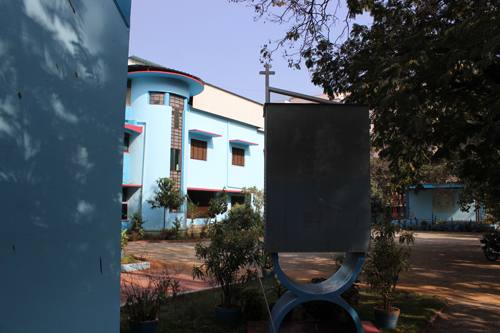 It is a Blue building with a boundary, inside which you will see a chapel. 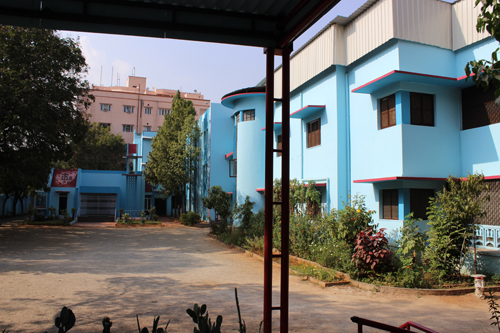 Satyodayam community consists of Eight Jesuits out of which four are working in the province curia. Fr. George Stephen is the superior of the community since 5th June 2013.